Oh yes friends! It’s that time of the year again; Christmas is round the corner with happiness blossoming on every quarter of every city around the world! With Christmas comes the inevitable excitement of not only giving gifts to our loved ones to be cherished (with the obvious Garb of Santa Claus revamped again for the season!) but also of giving a gift to the house we live in too, to decorate its nook and corners with any and every outrageous decorations that one could get hold of! And yet, all’s well since it’s the happiest time of the year again. One of the most important decorations during any Christmas preparation is the Big, illuminated Christmas tree apart from the many other extravagant frivolities that we engage in during this time. So, I came up with certain inexpensive and yet amazing ideas to decorate your Christmas home this time around…Some decorations for book lovers while some for children and etc. So if you’re looking for something different to do this Christmas, then read on and I hope you do enjoy them. This is a great hit whether you have a home strewing with children or no, since we all love getting gifts, especially on the Christmas morning! So why not, just pack all of those gifts brought into white boxes wrapped with colored ribbons around the base of that very great Christmas tree? Usually, red or pink ribbons look great! Well, are you from one of those places which do not snow during the winter and thus are thwarted in your perfect Christmas decorations by not having a snow man right outside your home? Well, no worries do you need have now…because I am here to save the day here for you,Ta da! A front door snowman or even a refrigerator snowman (looks best when your refrigerator is white!). Cut up two eyes, some smaller sized buttons from the black glazed paper; a bigger sized nose from the orange paper and glue them accordingly on your fridge or the front door. Finally, decorate a chart paper cut up in the size of a scarf whose length should be equal to the breadth of the door and decorate it with felt pens before gluing that too and voila! Your snowman without a vestige of snow is ready!!! In a glass container place a fairy light of any shape or size add some instant Christmas magic to the home. Now, the flavor of any Christmas is…Guess? Well, Lights of course! A Booky Christmas tree indeed!! For all the book lovers out there (like me!) who love anything bookish, here is a perfect treat for you! I call it the Booky Christmas tree! Around 80 to 100 books depending on the size of tree you are planning for. Uncover the lids from the bottles and spray silvery paint on them. Now, glue the snowmen and trees to the lids as well as the canning lids. Now, fill the jars with a little artificial snow and put the lids right back on. Now, just turn over and watch the snow show!!!! Now, let’s see the ingredients before we start doodling any further! Remove the middle portion from the apple the size of the carrot you’re using. Insert the carrot into the apple and place them on the plate so that the carrot rests perpendicular on the plate…Prick some toothpicks into the carrot as shown now, pin up your favorite fruits on the toothpicks. Oranges, kiwis, pineapples, grapes, strawberries and pretty much anything else! In the end, survey your result with satisfaction and gorge into this perfect Christmassy dessert…. :)..Splurge in! Take four pieces of felt and trace the template of the stocking. Use separate colors for the back and the front, and a different contrasting color for the lining. Next measure a grid of 1 inch squares on the back of the exterior stocking, after which draw lines in a criss cross pattern. Use the grid to help you out with the designs. Punch out different kinds of designs to your preference in different sizes and shapes. Using a pencil, move the design on the illustration on to your stocking. 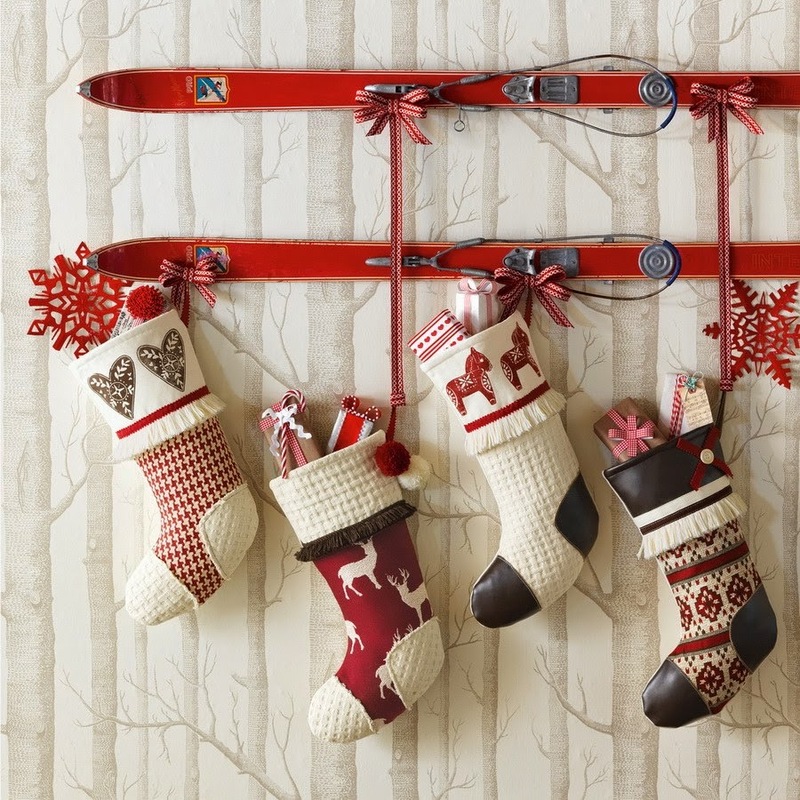 Keep repeating the pattern throughout the stocking till you have covered the whole thing. Leave a space of ½ an inch from the middle for the teardrops, the bigger holes, diagonal teardrops, and smaller holes are 1 inch, ¼ inch, and 1 ¼ inch from the middle respectively. Fold the felt on the edges of the grid, and keep punching out designs till the puncher can’t punch through the fabric anymore. Now to put the stocking together, sew all the four pieces together, but leave the top open. Cut in slits and small notches on the front part of the ankle. Now take the cuff template and trace it onto the felt, once done, cut it out. Cut on the edges using scissors with a scalloped blade Sew the shorter sides of the cuffs together. Now using the seam on the outside of the stocking, side the cuff to the top, leaving a gap of ¼ inch. Turn the socking the right way again, and fold the cuff down. Using the template as a guideline cut the hanging loop out; sew the loop inside the top part of the stocking. Lastly sew the bells on the very ends or right in the middle of the snowflake. So, there you go..! 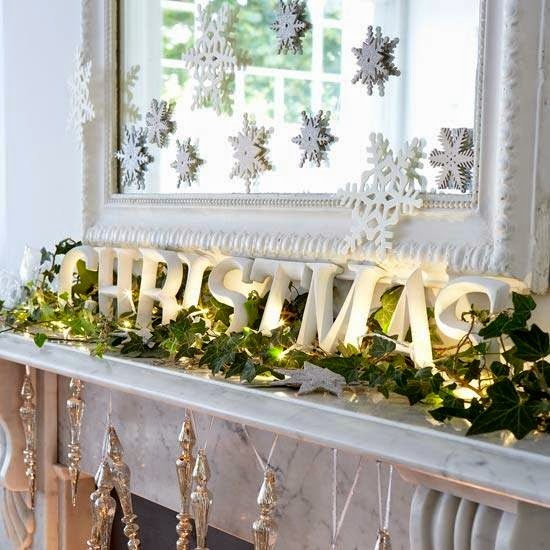 These were some of the ingenious ways in which you can decorate and liven up your Christmas! Hope you like them…until then, cheerio!